The demographics of Australian Muslim women has changed hugely over the past 3 decades. 30 years ago many had just arrived from civil war, politically troubled areas and were mostly cultural with little ability to speak English. They stayed within their cultural group, had difficulty coping with Australian culture and systems, and often married at a young age having large families in a low socio-economic environment. Today, Australian Muslim women are often highly educated, literate and professional, aspiring to careers in every discipline and challenging not only their cultural backgrounds, but the interpretations of Islam that previously applied to them. With more than 30,000 Muslim students graduating from accredited and registered Muslim schools around the nation, many are confident of their religious heritage, informed about Islam, and confident as Australians. 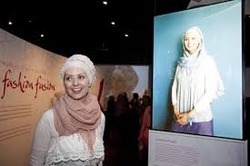 Australian Muslims are also innovative, leading new directions in art, fashion, law, journalism and business. Just 2 years ago the Word of the Year for the Macquarie Dictionary was the burqini - showcased above, which now sells internationally. Muslim women are often the leaders in resolving issues affecting their community, taking a decisive role in reducing internal divisions and tackling the social issues that underlie negatively reported events. The truth is, Australian Muslim women don't fit the stereotypical norm - they challenge it, while remaining true to the essential teachings of the Quran and their beloved Prophet Muhammad s.a.w. This week, the national conversation has been dominated by talk of whether the burqa should be banned in parliament, against a backdrop of tension brought about by the rise of the Islamic State and fears of a terror attack on Australian soil. Lydia is an Australian woman who converted to Islam at age 21. Now 29, she recently featured on the SBS series Living with the Enemy, where she opened up about what it’s like being a Muslim woman in Australia. Here, she writes exclusively for news.com.au about her story. It took a long time. It didn’t happen overnight. I don’t even know how to describe it, something just clicked. It all started when I was at university and the counter-terrorism laws were introduced in the wake of 9/11. I kept thinking “why do these bloody Muslims want to blow us up?” I thought that Muslim women were oppressed, I pitied them self-righteously. I thought their scarfs were an affront to feminism. To say I had strong and negative opinions about Islam and Muslims would be an understatement. Of course, I had never met a Muslim, but that didn’t stop me having an opinion on the type of people they were and how they lived their lives. I went to Auburn Gallipoli Mosque and all my misconceptions were washed away. There was a striking similarity between Islam and my Christian upbringing. We share the prophets of Abraham, Adam, Moses, Noah, Jesus, etc. Every Saturday I went to the Mosque with my scarf that I would wear out of respect to find out the “truth”; the ‘truth’ of course being why Islam justifies the killing of innocent people and why women are treated like chattel. Instead, I found a religion completely foreign to the one described in the media. My favourite verse from the Koran is still “He who kills one person is like killing all of humanity. He who saves one person is like saving all of humanity”. For a long time, I didn’t want to accept I had become a Muslim. I knew if I accepted the fact my whole life would change and honestly, it scared me. How would my parents react? How would my friends react? It was such a foreign thing for me to do. You’re quite aware there is not a great image of it. It’s not something that people go wow, congratulations! Once I made that decision, I was very conscious of the fact I would have to conduct myself in a certain way. If I do one thing wrong, everyone thinks I do it wrong because I’m a Muslim, not because I’m having a cranky day. People often ask me why I decided to wear the hijab. I wear it because it was recommended in the Koran for Muslim women to wear. The word hijab is not only about being physically modest, it also means being modest in speech and conduct. For me, it also provides me a way of interrupting the male gaze and rejecting our sexualisation of women. It has become a firm part of my external identity. Many people believe Muslim women wear the scarf for men. That is simply, not true. To be clear — Muslim men also have “hijab rules” too. I have a love-hate relationship with my scarf. Instead of having bad hair days, I have bad scarf days. Like any woman in the morning, after I have struggled to find something to wear, I spend the next twenty minutes trying to find a scarf that matches my outfit. Then I have to find a coordinated bonnet to wear underneath, then arrange it. Then try to find a pin to secure everything so it looks like I have put some thought into it and it doesn’t look like I have had a fight with the scarf and it has landed on my head. Usually, it looks like the latter. Oh, and to be clear — I don’t sleep or shower in it. The biggest misconception people have about Muslim women is that we are oppressed. The majority of Australian Muslim women (like the majority of Australian women who choose to wear Christian Louboutin stilettos ... which Australian Muslim women also wear) do so out of choice. We aren’t forced to wear the hijab. We make a conscious decision to do so. In fact, many women experience mixed attitudes from their family and friends when they make the decision to wear it, as we become instantly identifiable with the Muslim faith. Suddenly, as a woman who wears the hijab, I’ve been reduced to a symbol that is open for dissection, discussion, analysis and critique. I’ve received hate mail and told I should be taken “out the back and shot” and that “I should be beheaded”. I tell you this not to play the victim, but to highlight that by speaking out against ISIS and violence, ironically I’m threatened and attacked by non-Muslim Australians. It’s incredibly disappointing and bewildering to have my religion and choice to wear a hijab used as a lightning rod of controversy in discussions with political leaders. Australian Muslim women are highly educated, creative participants in our democracy. We aren’t bystanders. We have a voice. We use it. At what point do you take responsibility for choosing not to listen? At what point do you take responsibility for only listening to the narratives that reinforce your assumptions? I have higher expectations of our government in being socially responsible and not contributing to fault lines in our society by using inflammatory and divisive remarks. And while we’re talking about language — please use the right terms to distinguish between the hijab, burqa and the niqaab. At least I make the effort to distinguish between budgie smugglers, board shorts and European-style swimming trunks. I’ve gained so much since converting to Islam; a relationship with this god, guidance in difficult times. I have a very strong idea of who I am and what I stand for. I’ve always had a strong personality but it’s just crystallised. I did go through a hard time with a lot of friends telling me it was just a phase. I’m very confident with who I am and the choices I’ve made. There’s so many misunderstandings. People have to get over this fundamental desire to talk about Muslim women and not to Muslim women. People have to understand if they want to know they should ask us. They should come to the source. It’s not a very controversial topic. We’re not scary people. Well, unless I am having a cranky day.